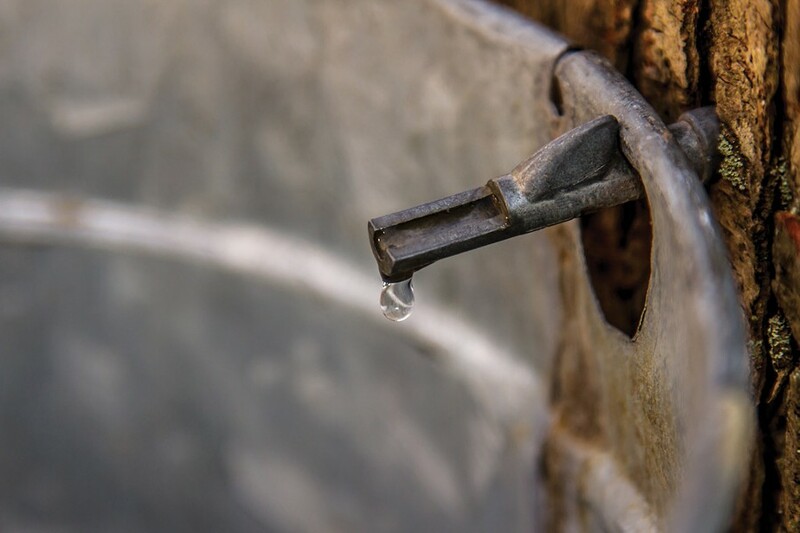 Most Vermonters know that maple sap runs when temperatures are above freezing during the day and below at night, and that the season ends when the trees "bud out." But for the past two winters, we've had patches of unseasonably warm weather, raising a question: When it's 60 degrees in February, what happens to the sugaring season? Furthermore, how does the increasing use of newer tapping technologies factor into the long-term health of Vermont's sugarbushes? To learn more about the current state of the state's sugaring operations, we called Mark Isselhardt, a maple specialist at the Proctor Maple Research Center of the University of Vermont Extension. The center publishes papers on all manner of issues that are important to maple producers, including ones titled "When to Stop," "Tapping Depth" and "Do Not Use IPA as Sanitizer" (that abbreviation refers to isopropyl alcohol, not to beer). Here's what Isselhardt had to say, along with some sweet recipes. SEVEN DAYS: How has 2017 been for sap production thus far? MARK ISSELHARDT: All seasons are sort of unique. The season started fairly early. There are people who produced syrup in January who never produced syrup in January before. SD: Is that a good thing for producers? MI: There's nothing inherently wrong with it ... They can choose to tap, or they can wait. Early-season sap usually has less sugar, so people without reverse osmosis [equipment] will be burning more fuel and getting less syrup for it. SD: Does a longer season impact the taps? MI: There's a limited amount of time you can collect sap from a tap hole. It's based on the tree's response to the wound. [And], when you open the tree up to the atmosphere, even if it's only for a few seconds, omnipresent yeast and bacteria start to infect that tap hole. As the season progresses, those populations tend to multiply, developing a gummy, snotty material that plugs up [the hole]. When people talk about tap holes drying up, they're talking about that plug: The plumbing is no longer conducive. The earlier you tap, the earlier you introduce that wound to the tree, and it's really hard to predict where the bulk of the flow will come in the season. [By tapping early,] it could be you capture the best runs of the season and everything's fine, or you might miss the end. SD: A lot of producers are using vacuum systems instead of gravity-based systems these days. How does that impact production? MI: With all other things being equal, it's easily double. SD: How does the vacuum affect the trees? MI: It's just the best question — also the hardest to answer. You're talking about a perennial plant, and you're talking about a really robust plant. Sugar maples can grow for 200 to 300 years, and they're really well adapted to this climate. There are trees that have been tapped for generations that show no signs of stress from the tapping. But, with modern technology, we can easily take two to three times as much sap, and you can't cut them down to try to determine the [amount of] stress [it's causing]. SD: Is anyone trying to figure that out? MI: We're in the fourth year of an experiment looking at the long-term impacts on trees that had never been tapped before: a portion not tapped, a portion tapped with traditional gravity, and another with vacuum. We'll follow those for 10 years. The anecdotal evidence is that technology has changed dramatically over 25 to 30 years, and there haven't been widespread die-offs of trees. SD: Does any damage from tapping pale in comparison to the effects of climate change? MI: It does appear that the climate that sugar maple is so well adapted to is [shrinking], so it will be a competitive disadvantage. Use the grade of syrup that you prefer. For baking, I usually go for the less expensive syrup formerly known as Grade B and now inelegantly labeled "Grade A Amber Color With Rich Taste." Preheat the oven to 350 degrees and set the cream cheese and butter in a warm place. Leaving the skins on, grate the carrots and apples on the coarse side of a cheese grater. You'll want 3 packed cups total. In a medium mixing bowl, combine the wheat flour, sugar, baking powder, baking soda, cinnamon and ginger. Stir with a fork. In a small mixing bowl, combine the eggs, oil, syrup and salt. Beat with a fork or whisk until uniform. Add the grated carrots and apples and stir briefly. Divide the batter into your pans. If you're making cupcakes, fill the cups only two-thirds full. (Seriously. Otherwise it'll be messy.) Same goes for the cake tins. 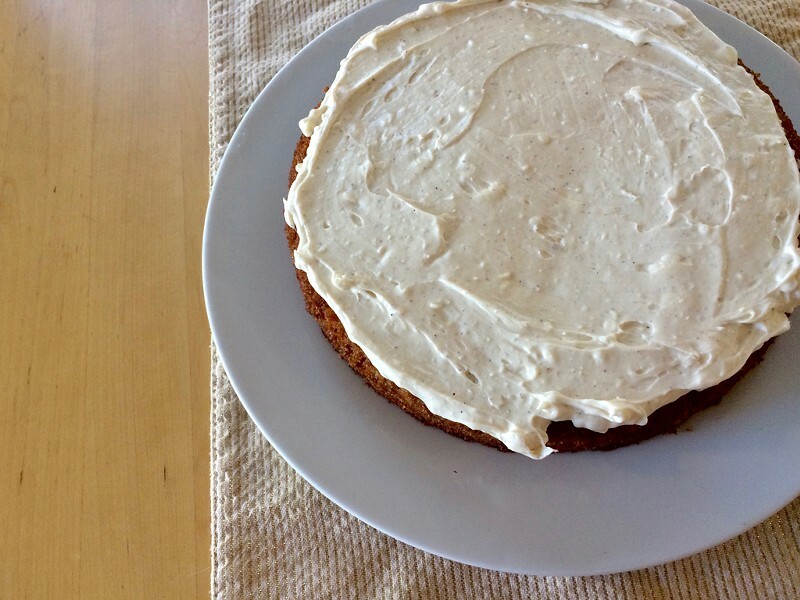 Bake until a sharp, pointy object inserted in the center of the cake comes out clean. Start checking cupcakes after 25 minutes. Check 8-inch cakes after 40 minutes. If the cake isn't done, check every five minutes until it is. Let cool on a rack if you have one. Make the frosting. In a mixing bowl, beat the cream cheese and butter with a wooden spoon or beaters until uniform. Stir in syrup, cardamom and salt. Taste and add more syrup, spice or salt as desired. When the cakes are cool, turn them out of the pans and frost them gently. It's like breakfast in a candy. Divide the bacon into four piles and cut the slices in half lengthwise. Then cut slices horizontally to make one-quarter-inch strips (called lardons). Cook the bacon over medium heat until crispy, stirring regularly. Pour off any fat that accumulates as you cook. When the bacon is done, drain it on paper towels. Pour the oats onto a cookie sheet and bake, stirring every five minutes, until toasty brown (12 to 15 minutes). Remove oats and turn off the oven. To make syrup, in a medium-size, high-walled pot, combine the sweeteners and butter. Cook over medium-low heat, stirring regularly and monitoring the temperature with a candy thermometer. While you wait for the syrup to reach temperature, the bacon will cool. Toss it with the oats in a small mixing bowl. Place a sheet of parchment on the oat cookie sheet and butter the parchment. Don't forget to stir the sugar mixture regularly. When the sugar mixture reaches 300 degrees (the hard-crack stage), move quickly! Remove the pot from the burner and immediately add the baking soda. Stir to start a chemical reaction that will cause the mixture to foam. Immediately stir in the salt, vanilla, and bacon-and-oat mixture. 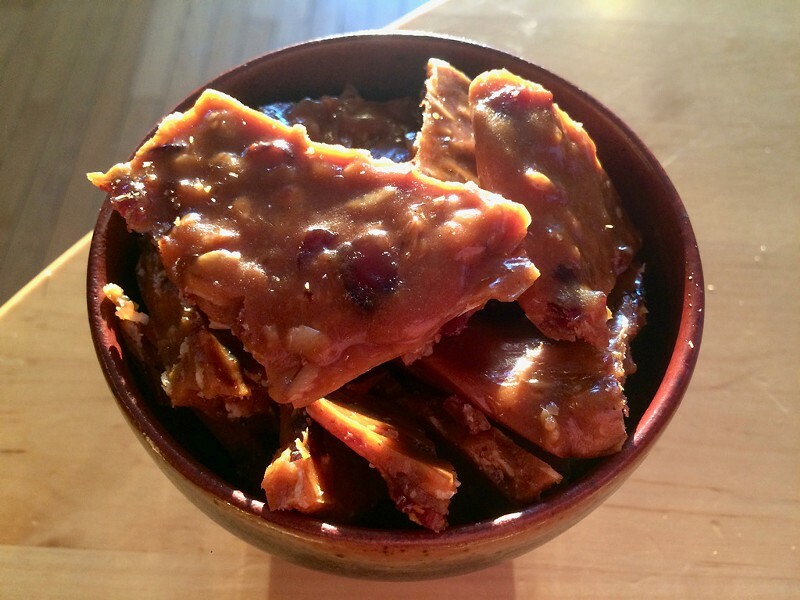 As soon as it's mixed, dump the candy onto the parchment-covered cookie sheet. Use a wooden spoon to spread it so it covers the whole surface. Set aside. Put hot water in the pot you used for the sugar mixture, and throw all of your candied utensils into it so they don't become permanently encrusted. When the candy has set completely, around 30 minutes, break into pieces and serve. The original print version of this article was headlined "Off and Running"